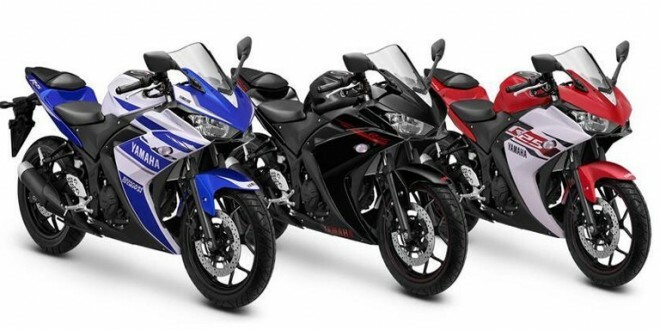 Bookings of much awaited Yamaha YZF-R3 has opened. YZF-R3 is a quarter-litre sports bike from Yamaha which is going to be launched by next week. Some Yamaha dealers have already started accepting bookings for this bike with an amount ranging from Rs 10,000 to Rs 30,000. It is important to note that Yamaha dealers have not received that stocks yet and the deliveries of the booked bikes are expected to happen by the end of this month. The on-road price of Yamaha YZF-R3 is expected to be around 3.5 Lakhs (Delhi). The yet to be released Yamaha YZF R3 shall be powered by a 321cc, 4-stroke, liquid-cooled, DOHC, in-line twin cylinder petrol engine which produces a maximum power of 42 PS @ 10,750 RPM and gives a peak torque of 29.6 Nm @ 9,000 RPM. The engine of Yamaha YZF-R3 has been mated with a 6-speed gearbox. The Yamaha YZF-R3 is basically a slightly different version of Yamaha R25 and gets a improved and bigger engine. It is still unclear that if Yamaha offers YZF-R3 in ABS version ( Anti-lock braking system) in India. If Yamaha YZF-R3 doesn’t come with ABS, it could hugely disappoint Yamaha fans in India and could also result in decreased sales.